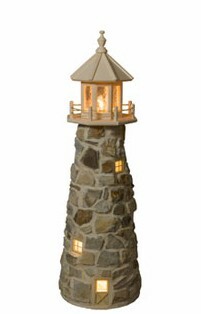 A poly lighthouse is a maintenance-free product, built to last a lifetime! It will not splinter, crack, or fade and needs no painting. 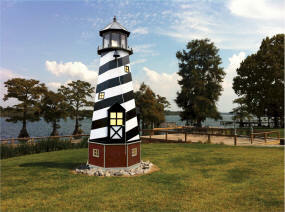 Each poly lighthouse is environmentally-friendly and is made from recycled material. Replica Poly lighthouses are available in Barnegat, Cape Henry, Marblehead, Cape Cod, Cape May, and Split Rock and other styles. 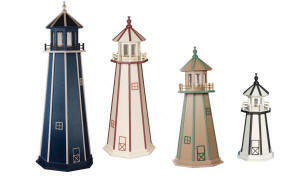 Standard Poly Lighthouses are available in a large selection of color combinations. Our Hybrid Lighthouses have a poly base and top which are maintenance-free and built to last a lifetime. Poly will not splinter, crack or fade and needs no painting. The center portion is handcrafted from a top quality signboard plywood and painted with a high-grade exterior paint. Whether you live near the shore or just want to bring a touch of nautical theme to your home's outdoor decorating, these Amish-made lighthouses will certainly be an eye-catching item. All lighthouses come complete with a working candlelight bulb that uses 110 volt. The two foot and three foot lighthouses have a 25-watt bulb and all other lighthouses have 40-watt bulbs. An automatic photocell light sensor is included with all 3' > 6' models which will turn the lighthouse light on and off automatically. Our lighthouses are made with weatherproof MDO board to provide you with long lasting resistance from the worse weather conditions. All Stone Lighthouses come with Interior Lighting. Real stone and mortar are used to construct our stone lighthouses. Sizes 4' to 12'.